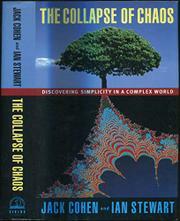  Riding the wave of popularizations of chaos and complexity theory is this new contender by a pair of English science writers, Cohen, a biologist, and Stewart, a mathematician. Rather than enthuse about the C words, they ask another question: If the universe is chaotic, where do the simplicities of nature come from? Then they proceed, for fully half the book, to lay out the current reductionist paradigm by which cosmology, culture, evolution, intelligence, etc., are the consequences of lower level ``simpler'' principles: quantum mechanics, chemistry, the genetic code. That done--and done quite well despite a style that is sometime too breezy by half--they spend the rest of the book pointing to the inadequacies of reductionism and building toward two explanatory principles which they call simplexity and complicity. Simplexity is ``the emergence of large-scale simplicities as direct consequences of rules,'' e.g., the patterns that emerge in John Horton Conway's computer game of life; and by extension, any features that emerge from sets of similar ground rules. Complicity is more like convergent evolution: different sets of rules generating similar features (e.g., bat wings versus bird wings). Either principle brings about a collapse of chaos. Basically, what they are saying is that you can't simply map a lower level of organization, say, the DNA code, into a living organism. There is instead a dynamic in which content and context are critical. The argument is fine. However, had the authors avoided cutesy neologisms, visits to another planet, and other textural distractions, their many useful examples and well-taken points might have been even better taken.